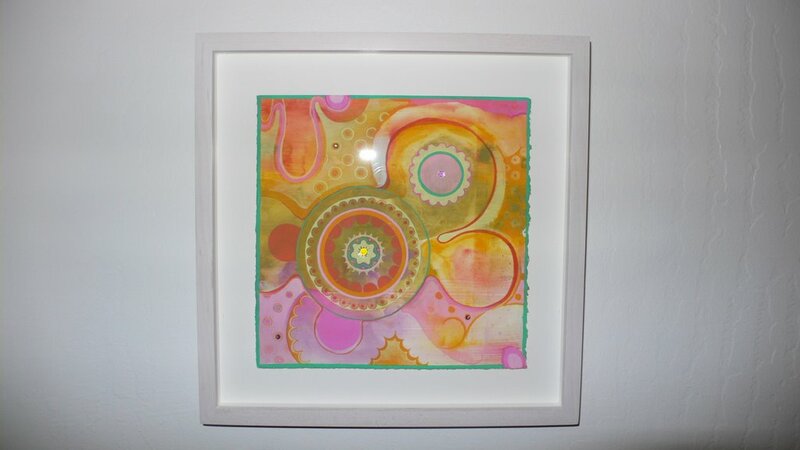 Bindi Dharma #16 by Julie Evans, Gouache and bindis on paper, 8" x 8"
I'm sorry that the photo is not the best. Also, I've been told I should crop out all but the image itself, but a. that's more work than I want to do and b. collectors thinking about purchasing her work should see the care she takes in a proper mounting. In fact, the proper mount is critical in my opinion. You want your work shown to its best, well then take control! Julie's new work is pretty stunnning too. Take a peek over at Julie Saul's. I like it an awful lot. It seems sharper, perhaps than ours. It looks like she decided at some point to go a bit darker of color too. If I could ask her a question I'd ask whether the Red River Extracts came before or after the rest. So beautiful. And gee, as I look around Ms. Saul's gallery I have to say that I like a lot of the work there. That's interesting. I wonder if other collectors have found that they sync up with a gallerist(s) and enjoy the work of many of the artists they represent or not. I thought that my affection for Thomas Reynolds' artists was lucky, but perhaps collectors sync with a gallerist's choices more than I thought. Anyone? I just received pricing for Julie's new work and, while her pieces are a skosh larger, the prices begin at $3K+ and end at $6K+. We paid less than $1K for the work we purchased and are quite happy with the increase in the value of her work. Again, this may be seen as a bit crass to discuss, but, I did want to write this as a collector and as such, the increase in value of some of our works is surely of interest to others (however few they may be) reading this blog. long time no talk...you should stop by some day. If I could ask her a question I'd ask whether the Red River Extracts came before or after the rest. So beautiful. I'll pass this along to Julie. Didn't realize that I had to "allow" your comment to show up. I've been by a few times since this writing. Sorry I'll miss y'all in Chitown next weekend. Lovely painting, "California Neighbourhood". I think I painted his sister/brother, "St. Jacques Tree" -- part of my "A Tree Grows in Montreal" series. Don't know how to download pics on a comments board, but if you go to my blog, Nov 12/06 you'll see it. Glad you're back. So interesting to hear about art from a collector's pov.